Patchwork tile floors and walls using encaustic cement tile are incredibly popular. Patchwork is a great way to add color and pattern to any room. The cheerful designs make you smile. A cement tile patchwork design was used for this kitchen backsplash. Photo credit: Avente Customer, Laurie Suarez. Last week, I received a call from our customer Laurie Suarez of in San Clemente, CA. She was interested in using our Bayahibe C for a powder room wall and wanted to know how much inventory we had. In February of this year, I worked with Laurie on a patchwork design for her kitchen backsplash. I couldn't help but ask her how the project came out. She told me she loved her kitchen. She explained, "The cement tile patchwork really provided the pop of color she wanted for her white kitchen." A few days later, she was kind enough to share these photos with me. I have to agree, Laurie did a great job blending the different colors and patterns from our Traditional Cement Tile collection. While it may appear that a patchwork design is a random hodgepodge of tiles, it takes planning and smart choices to get the colors and patterns to make a design. Laurie admitted that she worked with several different layouts to achieve her design and that it took some time. DESIGN TIP - Patchwork designs take planning to achieve a balanced layout with color and pattern. Try different layouts on paper. Print the layout you like best for your tile installer to use. The use of quarter design patterns makes this cement tile patchwork unique. You often seen patchworks in contemporary design. The large open space and clean lines of this architectural style allow a wall or floor to be the focal point for the spartan details. However, the use of complete quarter design patterns is rare for patchworks. Most often, only one of the four tiles in the quarter design is used so the pattern is not completed. Laurie's kitchen has some contemporary design elements with its open layout. However, I think it offers a very traditional feel because of the details: the Quaker-style cabinetry with vintage steel pulls and pendant lights with reeded glass. What I love about Laurie's design and what makes it unique is that she almost exclusively uses quarter-design patterns. Additionally, she tastefully blends the colorful, eclectic look of patchwork with traditional details. When cement tile patchwork designs adorn a wainscot or backsplash, they provide a focal point that brightens the room. Laurie was also careful with her color palette. For the patterns, she used a blend of different blue and yellow shades on white backgrounds. To avoid a garish look, follow Laurie's cue and stick to a color palette. Kudos to Laurie for flawlessly executing her patchwork design. I love this kitchen! You also should know that Laurie took the last of our Bayahibe C stock and will have it installed in her powder room wall. I can't wait to see the photos of that installation. Thank you Laurie for your business and sharing what you did. Nice job! 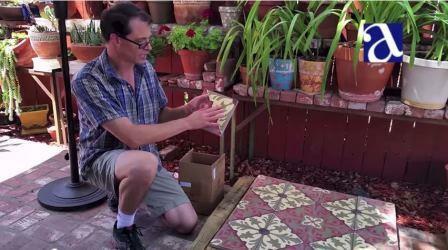 Interested in using cement tile for next home improvement project? With a range of design possibilities, handmade cement tiles will transform any space. See our Guide to Buying Handmade Cement Tile to get started today! Finally, during this week of Thanksgiving, all of us at Avente Tile are thankful for our wonderful customers who support us, work with us, and allow us to do what we love! Happy Thanksgiving. Despite hundreds of existing cement tile patterns, sometimes you just have to literally "break the mold." In the commercial design of this golf clubhouse, a simple contemporary design was created specifically for this environment. Custom cement tile patterns, like this one for a clubhouse, provide limitless possibilities for commercial design. The designer hit a hole in one with a custom pattern that speaks volumes about the flexibility of cement tile and how well it works in contemporary design. The simplicity of the repeating golf ball pattern on different shades of verdant green is a simple, fun metaphor. A detailed look at the custom cement tile pattern created exclusively for this clubhouse. The design places large cement tile rugs in the lounge and dining area of the clubhouse. The clean lines of contemporary design are found everywhere in the details - from the furniture to the floor. The decision to use a custom cement tile pattern strategically on the floor is a smart choice. It creates intimate areas in the open, expanse of the room. Notice how nicely it pairs with the neutral, large-format natural stone flooring. Cement tile rugs create cozy, intimate dining areas in the expanse of the room. Cement tiles are created by pouring pigmented cement into a mold that creates the pattern on each tile. If the pattern is not a available in the factories repertoire of molds, it has to be created from scratch. Of course, there is additional cost and time to create a custom mold; but, the design will certainly be unique! Existing cement tile molds. Custom patterns require a new mold to be created. Want to see more photos of this commercial clubhouse installation? View the slideshow below, or click to see Cement Tile area a Hole in One for Greens. Cement tiles provide flexibility for commercial designs because they can be customized with your pattern, choice of colors and unique shapes. The tile adapt to any setting and work well in contemporary or traditional installations. Finally, you can't forget that cement tile are durable and will withstand decades of wear with little care. Designers in the hotel, hospitality, or restaurant industry use custom cement tile patterns and designs to create a look that stands out and is unique. Take a look at these commercial cement tile installations for inspiration on your next commercial design project. In today's hectic 24/7 world, a quiet place to escape, relax, renew, and refresh is more important than ever before. Designers cleverly chose cement tile flooring for this resort spa to achieve a calm and peaceful atmosphere in a commercial setting. Commercial flooring is often dismissed as unimportant and reduced to low-cost options. In this spa, the opposite approach was taken. The flooring is the design element that establishes the theme, creates the ambiance and sets the tone. The cement tile floor utilizes a simple interlocking circle pattern and two-tone color palette in soothing green to create tranquility. Other smart design choices were made to complement the theme; one of my favorite is the use of white river rock along the corridors and stacked white rock at the reception desk. The river rock mimics the tile pattern and provides the soothing effect of a flowing stream. Cement tile in a soothing green and simple pattern create calm at this resort spa. The Geometric Diamond Pattern uses two shades of light green on a white background to emphasize the interlocking circles. I love how the darker shade of green is used to help create the illusion of over-lapping circles. DESIGN TIP - To achieve a contemporary look with cement tile, use geometric patterns. Limit yourself to two or three colors. It's best to pair a neutral color with two tones of another color, such as tan coupled with a light green and dark green. Geometric patterns in a straight-forward color palette with only a few colors are a great way to create a contemporary look in commercial applications. To achieve a contemporary look with cement tile, choose patterns that aren't too fussy, like our Geometric patterns. Limit yourself to two or three colors, pairing a neutral with another color in different shades or lighter/darker saturation. To see more photos of this commercial resort spa installation view the slideshow below, or click to view Cement Tile Spa. Cement tiles provide flexibility for commercial designs with their choice of patterns, colors and shapes. They work equally well in contemporary installations or traditional settings. Additionally, they are durable and will withstand decades of wear with little care. Designers in the hotel, hospitality, or restaurant industry use cement tile to create a look that stands out or speak to a special need. Take a look at these commercial cement tile installations to start getting inspiration for your next commercial design project. When you see a finished cement tile installation (or any tile installation), it's hard to visualize just how bad it looked when grout was first applied. The only way to get grout into the joints is by spreading it with a tile trowel. With glazed ceramic tile, grout removal and clean-up can be difficult. 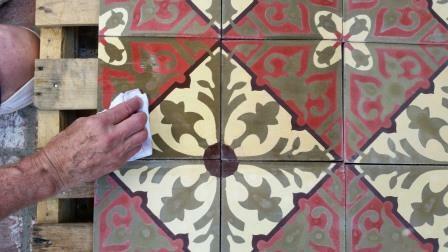 The task becomes more arduous when a porous material, such as cement tile, needs to be cleaned up. That's where pre-sealing comes in. Handmade cement tile offers a range of design possibilities for any commercial, hospitality, or retail space. The benefit of a pre-sealer, or "grout release" product, is to make sure the grout can be easily removed after spreading it onto the tile and into the joints. By applying a grout release prior to installing the tile, you get the added benefit of inspecting each tile, as well as the opportunity to cull any tile that might be damaged or off-color prior to the actual installation. While preparing to pre-seal your cement tile, take the opportunity to inspect each tile. Handmade cement tile offers a range of design possibilities - bold Cuban tile patterns in contrasting colors, or classic cement patterns in harmonizing colors. Whether used as floor tile or wall tile, the result will transform any space. We've assembled dozens of images filled with cement tile design ideas to help you get started on your next project. To learn more about cement tile and to see how a pre-sealer is applied, watch our latest video, How to Apply a Grout Release - Cement Tile Install Tips. This short video shows how to apply grout release to cement tiles in an easy-to-understand format. Making time for this additional step will protect your tile from the hazards of even the most skilled of installers, while making sure the grout is easily removed. In the coming months, we'll provide more tips on how to successfully install cement tiles. Stay tuned! In the meantime, for more information about cement tile selection, installation tips, customization services, or available sizes, shapes and more, please see our new Guide to Buying Handmade Cement Tile. Once a building has been erected, or is in the process of an overhaul, it's up to the designers to translate and transform the vision of the commercial, retail or hospitality space into a sensory-pleasing experience. Whether it's a grand lobby, a spectacular lounge or bar area, or even the common areas such as hallways and corridors, the designer is tasked with giving these spaces character and interest. Therefore, it's no surprise that tile is the perfect component in making these visions come to life, specifically, cement tile. With cement tile, these spaces are given a historic feel from a material that has been used for centuries, with the added benefit of being able to customize patterns and colors. Saltillo tiles also fall into the same timeless category as cement tiles. Because of their deep, rich hues, Saltillo tiles have the ability of transporting us to the colorful, refined grandeur of sun-kissed Spanish villas and haciendas of the Mediterranean. With their inherit versatility and durability, it's for these reasons that designers and specifiers overwhelmingly choose the always stylish looks of handmade cement tiles and Saltillo tiles. What's better than cement tile that are in-stock and ready to ship NOW? Saving on those same tile! 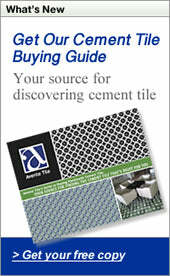 Mention coupon code THANKS and we'll thank you with 10% off any order of cement tile that is in stock. Limited to quantities on hand, so don't delay. Plenty of tile for that residential project you want completed before the holidays!